According to a court order filed on Tuesday, the judge is slated to hear arguments on Dec. 6 regarding Apple's move for a permanent injunction against eight Samsung handsets identified on Monday, reports Reuters. The order also outlines the deadlines by which both parties must submit their respective replies and oppositions regarding post-judgment filings. In the interest of expediency, Judge Koh has consolidated other post-trial motions for the Dec. 6 hearing. Apple and Samsung were initially scheduled to meet on Sept. 20 to discuss the injunction, but that date is now reserved for the Korean company's request to dissolve a sales ban against the Galaxy 10.1. Judge Koh is once again pushing for strict adherence to her mandates regarding post-judgment motions, a position she took during the trial to avoid an onslaught of filings. During the trial, the judge fought to keep the case on track as her "rag tag" team was having trouble keeping up with filings from the two companies' "legion" of lawyers. The page limits set forth herein will be strictly enforced. Any argument that is not explicitly articulated within the briefing page limits will be disregarded. Any supporting documentation shall be for corroboration purposes solely and shall not be used as a vehicle for circumventing the Courts page limits. Any citations to the record must include the relevant testimony or exhibit language. Any single-spaced bullets in an attempt to circumvent the briefing page limits will be disregarded. 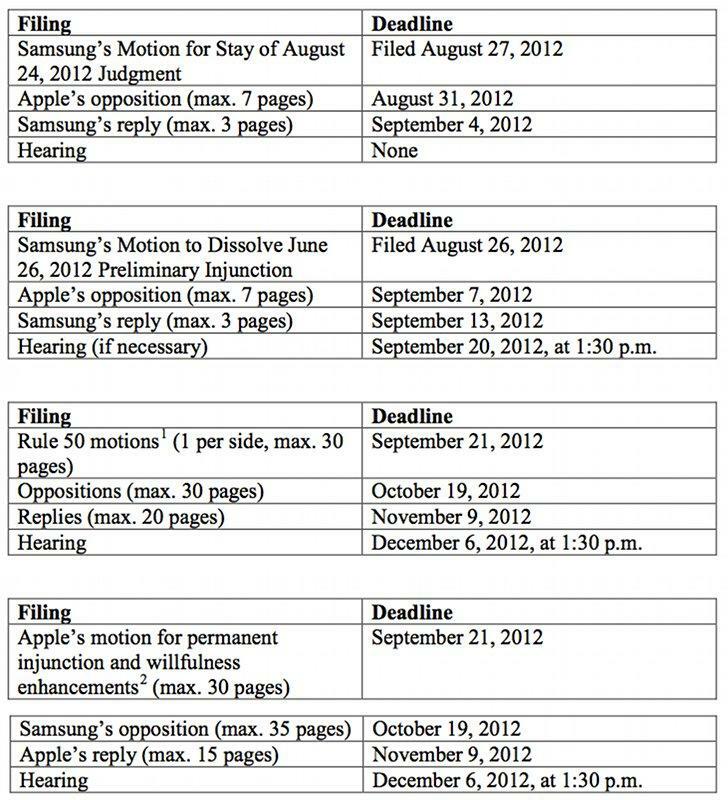 Apple on Friday won a sweeping victory over Samsung as a jury found Samsung in violation of six Apple design and utility patents, assigning damages of nearly $1.05 billion for the offense.